Murder, She Gamed: I just know a lot of you are longstanding Jessica Fletcher fans. Murder, She Gamed: I just know a lot of you are longstanding Jessica Fletcher fans. 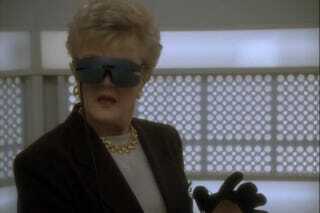 I'm equally sure that you all know about the 1993 episode of Murder, She Wrote where the intrepid author entered a virtual reality apparatus not entirely unlike the Oculus Rift and, while solving a murder, wrote her own VR game. But on the CRAZY OFF-CHANCE that you didn't watch that show, Wired has a new, highly enjoyable write-up of the episode.